I'm based in the UK. I'm in the market for a new phone, and I'd like to be able to see a list of the cheapest places for a phone with options that I specify. For example, if I'm after a sim-free, dual-sim Google Pixel in white with 128GB of space, I'd like to be able to input those options and return only results for products matching them, sorted by price from lowest to highest. The only solutions that I can currently find appear not to support the explicit specifying of options, requiring a user to wade through lots of redundant results, or else pull results only from Amazon.co.uk, without searching the sites of retailers like Curry's or Argos, which can sometimes be cheaper. Are there any websites like this? If there aren't... could someone please make one? 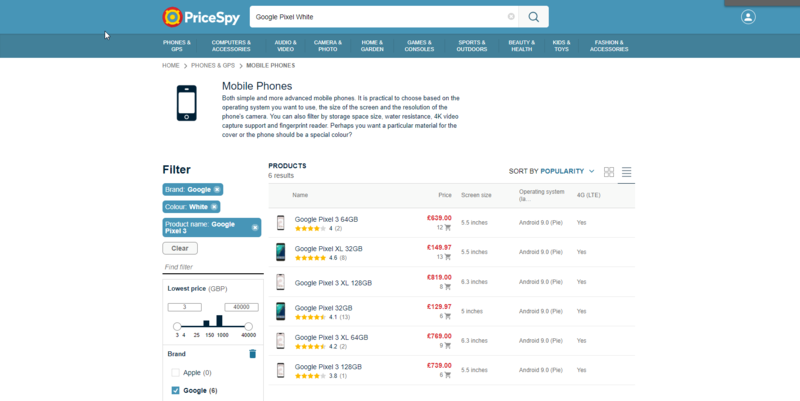 A website that comes close to what you are looking for is pricespy.co.uk. It allows you to specify the manufacturer, the color, the product name. The only problem I can find is in case two products are named quite the same such as Google Pixel 3 and Google Pixel 3 XL. If you specify the product name as Google Pixel 3, it will include Google Pixel 3 XL as well. There are tons of filters to go through so you might be able to narrow it down further to just Google Pixel 3, white, 128GB. Not the answer you're looking for? Browse other questions tagged web-apps shopping or ask your own question.